These lovely wire wrapped brass stick dangle earrings complement any face shape! They're 3 3/4" in length from top of ear wire to very bottom of wire wrapped brass stick. The brass "stick" is 10 gauge brass wire that's been hammered for texture and strength then wire wrapped in 12k gold filled wire for dimension and beauty. 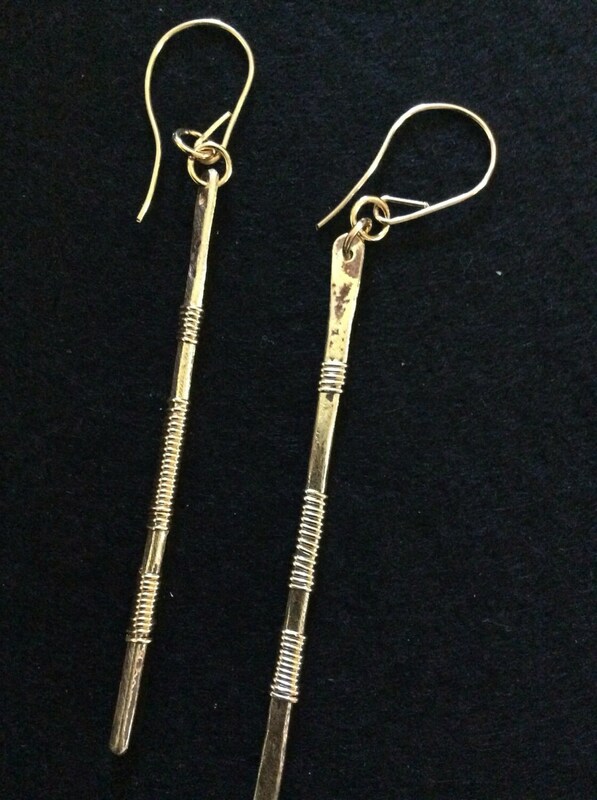 The hand forged ear wires are created from 19 ga gold filled hard wire to make a one of a kind functional finding! The overall profile of this earring is lean and narrow; causing any face to appear elongated and slimmer. We all could use a bit of that look, couldn't we? These earrings are simple yet elegant; able to be worn with casual or formal wear. I promise compliments will flow as people ask where you bought such understated, "bohemian vibed" pieces of art! Your jewelry will arrive in a black gift box. Id be happy to send it to another address if you convo me.